M Kestelli. Mitral Valve Prolapse In Atrial Septal Defect. The Internet Journal of Cardiology. 2001 Volume 1 Number 2. Mitral valve prolapse is encountered at a rate of 25-95 % in patients with atrial septal defect. In this study, we aimed at obtaining physiopathological patterns causing mitral valve prolapse in patients with atrial septal defect by comparing the patients with atrial septal defect but no mitral valve prolapse (Group 1) to those with atrial septal defect and mitral valve prolapse (Group 2) in accordance with the following echocardiographic parameters: diastolic interventricular septum thickness, diastolic left ventricular posterior wall thickness, left ventricular ejection fraction, left ventricle end-diastolic diameter, left ventricle end-systolic diameter, right ventricular out-flow tract diameter, right ventricular in-flow tract diameter and mitral valve area calculated with pressure half-time. There were significant differences between the two groups in terms of diastolic interventricular septum thickness and left ventricular posterior wall thickness (10±2.16 to 8.7±0.38 and 9.27±l.56 to 8.1±l.18, p<0.0035 and p<0.0006 respectively). The left ventricular ejection fraction was found to be significantly high in patients with atrial septal defect and mitral valve prolapse (72.26±5.48 to 69.06±6.23, p<0.011). The Incidence of mitral valve prolapse in patients with atrial septal defect (ASD) has been reported to be high1,2,3,4. This incidence is about 35 %. In their study, Lieppe et al. have found the incidence to of MVP in patients with ASD to be 95 % by means of two- dimensional echocardiography 5. The reason for this high incidence has not been completely explained yet. The discussion on the high incidence of MVP in patients with ASD have focused on two hypotheses 6. One of these is the anatomical co-existence of ASD and MVP as a result of a congenital common connective tissue defect. The other hypothesis is the anomaly occurring in the geometry ofthe left ventricle due to ASD. In this study, it was tried to obtain physiopathological patterns causing MVP by echocardiographically comparing the patients with ASD and MVP to the ones with ASD but no MVP. In this study, the echocardiographic parameters of 33 patients with ASD but no MVP (Group 1) and those of 30 patients with ASD and MVP (Group 2) were compared. Group 1 consisted of 26 female and 7 male patients and the average age was 48.5 ±12 (between 21-65 years of age). Group 2 consisted of 25 female and 5 male patients and the average age was 45.5 ±6 (between 22-62 years of age). There were no statistical differences between the two groups in terms of age and gender (table 1). In both groups, there was a case of mitral insufficiency and the assessment of their left ventricles was within normal limits. Table 1: Characteristics of groups according to gender and age. The groups were compared according to the following echocardiographic parameters: diastolic interventricular septum thickness (DIVST), diastolic left ventricular posterior wall thickness (DLVPWT), left ventricular ejection fraction (LVEF), left ventricular end-diastolic diameter (LVEDD), left ventricular end-systolic diameter (LVESD), right ventricular out-flow tract diameter (RVOTD), right ventricular in-flow tract diameter (RVITD) and mitral valve area (MVA) calculated with pressure half-time. In the study, the parameters were obtained by utilising Ultramark 6-3.5 mHrz electronic doppler echocardiograph. Measurements were carried out parastemal long axis by one and the same person. The results were statistically assessed wIth t-student test. Values under p<0.05 were regarded as being statistically significant. Patients exhibiting segmentary wall movement disorder were not included in the study. Between the two groups, there were statistically significant differences in terms of diastolic interventricular septum thickness and diastolic Ieft ventricular posterior wall thickness. DIVST was 10 ±2.16 mm in Group 1 while it was 8.76 ±0.38 mm in Group 2 (p<0.0035). DLVPWT was 9.27 ±1.56 mm in Group 1, whereas it was 8.1 ±l.8 mm in Group 2 (p<0.006). Besides, LVEF was found to be significantly high in Group 2 (72.26 ±5.48 to 69.06 ±6.23, p<0.011). Echocardiographical parameters of both groups have been shown in Table 2. Table 2: Echocardiographic results. Abbreviations: (DIVST) diastolic interventricular septum thickness, (DLVPWT) diastolic Ieft ventricular posterior wall thickness, (LVEF) Ieft ventricular ejection fraction, (LVEDD) Ieft ventrIcular end-diastolic diarneter, (LVESD) Ieft ventricular end-systolic diarneter, (RVOTD) right ventricular out-tlow tract diameter, (RVITD) right ventricular in-tlow tract diarneter and (MVA) mitral valve area calculated with pressure half- time. Isolated mitral valve prolapse is observed in 2.5-5 % of general population7,8. The incidence is higher in women than in men. Today, MVP is the most common cause of isolated mitral insufficiency which requires mitral valve surgery9. Isolated MVP is divided into two groups: functional and anatomical. Anatomical MVP comprises chorda elongation and leaflet elongation. In a study, as an example of functional MVP, dehydratation was formed by giving furosemid to healthy women with previously normal cardiac findings, and hence, functional mitral valve prolapse was simulated. MVP which developed in these patients was discontinued with rehydratation10. The rate of observing MVP in patients with ASD varies between 35-95 % in various studies1-5. MVP has regressed after ASD has been repaired. Right ventricular volume loading, right ventricular dilatation and paradoxical septal movement have been observed in patients with ASD11,12,13. As a result, MVP is functional in patient with ASD. The relationship between functional MVP and right ventricular dilatation resulting from pulmonary hypertension which develops secondary to toxication has been shown in a study. In this study, MVP has been observed at a rate of 9.3 % in patients with a right ventricle of normal size, 30 % in those with borderline right ventricular dilatation and 56 % in the ones with serious right ventricular dilatation14. It has been tried to be shown by Scraiber 15 et al. that there is a relationship between ASD and MVP, and that it is related to end-diastolic movement of septum. We have not been able to relate the left ventricular eccentricity occurring due to end-diastolic intraventricular septum paradoxal movement developing secondary to right ventricular volume loading to MVP occurring in systol. As for our result, when we take the mitral leaflet as the base of a triangle, and the chorda-papiller muscle system and the left ventricle wall as the sides of the triangle, MVP occurs as a result of the mathematical irregularity of this system. During left ventricular ejection, while the minor (transverse) axis of the heart shortens 27-37 %, the major axis (between the base and the apex of the heart) shortens 9 %. We are of the opinion that an excessive increase in the minor axis of the above mentioned triangle will cause functional MVP. 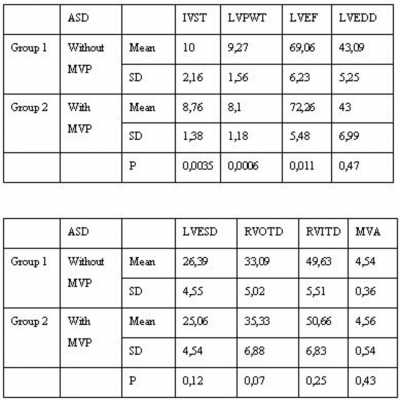 In our study, LV ejection fraction was found to be significantly high in group MVP with ASD. In the light of our results, in patients with ASD, if the left ventricular wall is thin, MVP occurs due to a better left ventricular filling and a higher Ieft ventricular ejection fraction. However, we believe that further research on left and right ventricular volume equation and leaflet co-aptation physiology is necessary. 1. Pocock WA, Barlow JB: An association between the billowing posterior mitral leaflet syndrome and congenital heart disease, particularly atrial septal defect. Am Heart J 1971;81(5):720-2. 2. Jeresaty RM: Mitral valve prolapse-click syndrome in atrial septal defect. Chest 1975;67(2):132-3. 3. Leachman RD, Cokkinos DV, Cooley DA: Association of ostium secundum atrial septal defects with mitral valve prolapse. Am J CardioI 1976;38(2):167-9. 4. Menachemi E, Aintablian A, Hamby RI: Ostium primum atrial septal defect. Associated with mitral valve prolapse. N Y State J Med 1975;75(12):2234-5. 5. Lieppe W, Scallion R, Behar VS, Kisslo JA: Two-dimensional echocardiographic findings in atrial septal defect. Circulation 1977;56 (3 ):447-56. 7. Savage DD, Garrison RJ, Devereux RB, Castelli WP, Anderson SJ, Levy D et al. Mitral valve prolapse in the general popülation. 1. Epidemiologic features: The Framingham Study. Am Heart J 1983;106:571-6. 8. Hickey AJ, Wolfers J, Wilcken DE. Mitral valve prolapse, prevalence in an Australian population. Med J Aust 1981;1:31-3. 9. Guy FC, MacDonald RP, Fraser DB, Smith ER. Mitral valve prolapse as a cause of hemodynamically important mitral regurgitation. Can J Surg 1980;23:166-70. 10. Lax D, Eicher M, Goldberg SJ: Mild dehydration induced echocardiographic signs of mitral valve prolapse in healthy females with prior normal cardiac jindings. Am Heart J 1992;124(6):1533-40. 11. Diamond MA, Dillon JC, Haine CL, Chang S, Feigenbaum H: Echocardiographic features of atrial septal defect. Circulation 1971;43(1):129-35. 12. Kerber RE, Dippel WF, Abboud FM: Abnormal motion of the interventricular septum in right ventricular volume overload. Experimental and clinical echocardiographic studies. Circulation 1973;48(1):86-96. 13. Weyman AE, Wann S, Feigenbaum H; Dillon JC: Mechanism of abnormal septal motion in patients with right ventricular volume overload: a cross-sectional echocardiographic study. Circulation 1976;54(2):179-86. 14. Garcia-Dorado D, Garcia EJ, Bello L, Maroto E, Almazan A, Gomez A et al: Mitral valve prolapse secondary to right ventricular enlargement in patients with pulmonary hypertension after toxic rapeseed oil ingestion. Eur Heart J 1985;6(1):85-90. 15. Schreiber TL, Feigenbaum H, Weyman AE: Effect of atrial septal defect repair on left ventricular geometry and degree of mitral valve prolapse. Circulation 1980;61 (5):888-96. 16. Rankin JS, McHale PA, Arentzen CE, Ling D, Greenfield JC Jr, Anderson RW: The three-dimensional dynamic geometry of the left ventricle in the conscious dog. Circ Res 1976;39(3):304-13.